For the full lineup and running order go to www.campusrock.at! I think it’s gonna be great (well, I’ll only be there on Saturday) and I also hope that they wont have financial losses afterwards as they had three years ago when they had e.g. IAMX, Virgina Jetzt and 4lyn. Well that’s what I asked myself two times recently. The first time was on Sunday when I originally planned to go to Maribor/Slovenia to watch the Nissan UCI Mountainbike World Cup downhill race. But well, the evening before it came to me that I had left my passport in the flat in Vienna. As I don’t have a Personalausweis and didn’t want to risk being checked by the Slovene police I didn’t go But I learned from that and directly went to the Magistratisches Bezirksamt on Tuesday and ordered a Personalausweis. Well I still had to go and have a picture taken that complied with the current regulations. 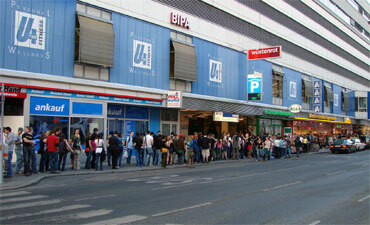 And yesterday I wanted to go to the FM4 Überraschungskonzert with Fettes Brot at the U4. Well I didn’t win a place on the guest list and so I wanted to get there at about 20:15. But actually (because I didn’t hurry up in the end) I arrived there at about 20:35 and obviously didn’t get in because there was a very long queue in front of the entrance. So I waited there for about 90 minutes still with an estimated 70 people in front of me until at about 22:00 they told us that they had reached the maximum capacity of 600 people. On Sunday the somehow annual meeting of Flickr people in Vienna – mainly from the “Guess Where Vienna” group – took place. As I’m on Flickr just for half a year or so it was the first time I was at one of that meetings. So the first part of the meeting was a photo walk. 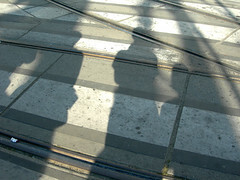 We (about 30 people) met at the Ottakring U3 terminus/S-Bahn stop in the afternoon and set off towards the city center. 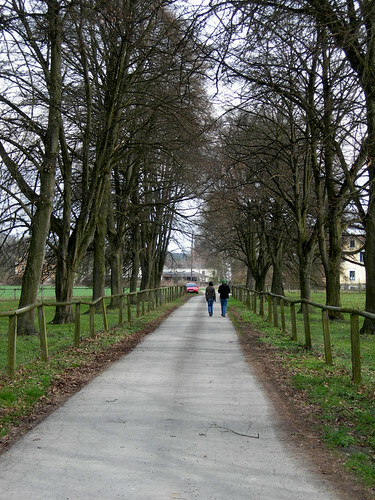 Or destination was the Siebensternbräu in Siebensterngasse in the 7th district where we planned to have something to eat and drink afterwards. On the way of course we took quite a lot of pictures. 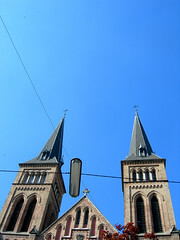 We passed the Familienkirche, the Ottakringer brewery, crossed the Gürtel at Josefstädterstraße and continued to Neubaugasse and finally Siebensterngasse. So at about 6pm we reached Siebensternbräu, sat down at our previously reserved table and had a drink. It was just when the first of us had already ordered something to eat that the quarrel with the waiter started. Well two people in the group had also brought their children to the meeting and those children were killing time in the beer garden while waiting for their meal. This was already a thing for the waiters to argue about and somewhere in mid conversation he said very loudly “The children MUST stay seated at the table!!”. I don’t know who actually started this quarrel and actually I don’t wanna know because it’s none of my business. But still we decided very quickly that we wanted to get out of this place, asap. That’s what we did after we finished out drinks/meals. So after this some of us went home but the bigger part of the group decided to go to some other place which was to be Plutzerbräu, just a few meters away. We had a really nice evening there, looking at pictures, obviously taking a lot of pictures as well and talking about this and that. So when this place finally closed around midnight most had already gone home. A funny episode was still that before we got out some of us (including me) wanted to go to the toilet once again, but it was completely dark inside and there was no switch to be seen. So we asked the waiter to switch it on again but he told us that the light in there is controlled by an automatic timer and that there is no way he can manually switch it on. Well so the remaining few of us decided that it was still too early to go home. Nearly every place was closed by that time (Sunday night) but then I learned to know the backup location for such a case, the Europa in Zollergasse, which acutally is a really nice place. We had one more drink there and that finally was it. I have to say that it was definitely worth it going to that meeting. It was nice to get to know some of the people in person who’s photos I’m looking at and exchanging comments with regularly. To see all of my photos from that afternoon/evening go here. There is also a dedicated group for this meeting here, where you can also have a look at other participants’ photos. 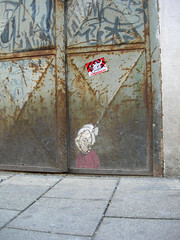 Yes, as I already mentioned someday, I really like Vienna. But Vienna at night is also great. Not only the concerts and other events and locations for going out. I also like walking through the city at night on my way home after going out when all the streets are nearly empty. Like Friday night I walked about half of Margarethenstraße, first to Schikaneder and afterwards to the night bus. 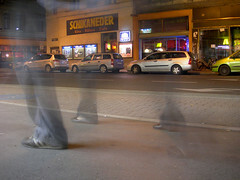 By the way there also is a great hip-hop track about “Wien bei Nacht” by Herbe Mischung. You can download it here for free. Well, so what were my nightly activities this week. Thursday night there was the FM4 Überraschungskonzert with the German band Lichter at Camera Club in Neubaugasse. Well I just knew two of their songs (the ones they got on Myspace) before I went to the concert. And well, they played their best known and greatest song “Leerer Raum” right in the beginning, which I personally think was not such a great idea because after this it couldn’t get much better. So the concert was rather a bit boring because the music isn’t really danceable. I think that the songs may be really great on CD/radio or when performed live at a different location (one with a lot of sitting opportunities). Anyway, the last two songs (“Leerer Raum – Remix”, “Vorstadt”) were great again. And Friday night (23:00) was the premiere of the Austrian mountainbike film “Ridin the Alps” at Schikaneder. The film was really great and some of the riders that can be seen in the movie were also at the premiere. Go, watch the trailer here! So this was/is a nice week(end). Ah yes and there also was the Argus Bikefestival with the Vienna Air King at the Rathausplatz but there will be a separate report on that. If you look to the top right area of this blog now, you will see that there is some more content. This are excerpts of my other new/old blog Sophisticated & Coarse | Notes & Thoughts. That blog can be found at the same address as my original IVIED blog which I started about a year ago and then moved over here. I just reactivated that blog now to be my second blog for short notes and announcements. The main blogging (longer stories and reports) will still be on this blog here. So just let me say a few more words about the name of the new blog. “Sophisticated & Coarse” comes from the song “Sophisticated & Coarse (Everyday Thoughts)” by Ty feat. Eska which can be found on Gilles Peterson’s “Worldwide Exclusives” compilation (Talkin Loud, 2004). And the “Notes & Thoughts” just defines what it’s all about. So (hopefully) I will be keeping you up to date more regularly with these two blogs. PS: To read the full posts of the “Sophisticated & Coarse” blog just click the “(…)” at the end of the excerpt above. From Monday to Tuesday I went on a one-day trip to Graz. 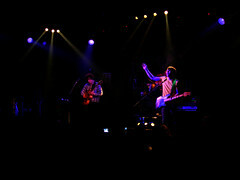 I went there to meet some friends of mine and go to the concert of The Wombats at the P.P.C. Before that I payed a visit to Graz’s finest cafe Tribeka, the best and trendiest place to go for a coffee. While sitting there drinking my cafe latte I was playing around with my camera a bit and took some nice pictures form the table top. So then off to the P.P.C. for the concert. 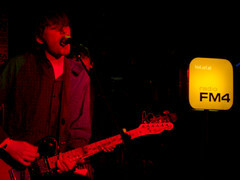 First the young band Stereoface from Graz was on stage and they did well. After this of course The Wombats entered the stage. Their gig was straight rock as I knew them from the radio (I actually had only know two songs of them before). Of course at “Let’s dance to Joy Division” people were making the most nose. It was a good concert and afterwards we went for one more beer to the cafe opposite of the P.P.C. 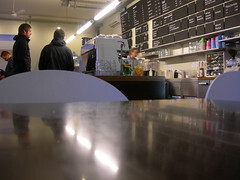 called “Café Immervoll”. Well they couldn’t have chosen a more inappropriate name for this place because when we entered it was nearly empty. After an hour or so we walked home anyway. 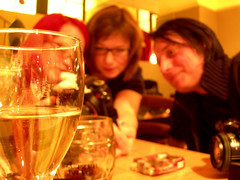 It was a nice trip to Graz, met some people again, got to know some new ones and been to a really nice concert. By the way, when I went back to Vienna on the 25-minutes-late Intercity “Croatia” there was a police check in which everyone had to produce his/her ID. I’m not sure if the three policemen and -women checked every compartment or only those with suspicious looking passengers inside. Anyways in mine there was a guy who looked like he was from the Middle East (actually he was from India). For him the check took a bit longer because they checked his passport and pilot licence exactly but in the end it seemed like it was OK.
Well actuall I planned to post a list of all books I read in 2007 last January. But as you might have noticed this has never happened. So now finally here is a list of all books I read between January 2007 and today, in the order I read them including my rating of the books. As you can see I don’t read that many books. Well actually I hadn’t read a single one since April when in October I saw how many books E. reads and thought that it might be a good idea to start reading books again. Since then I’ve been reading one book after the other. 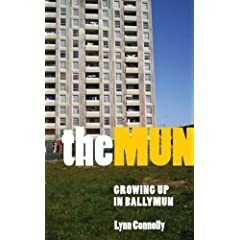 A autobiographic story about growing up in the Ballymun district on Dublin. Interesting facts. 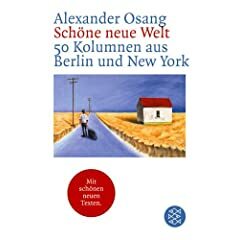 This is a collection of newspaper articles by Alexander Osang mostly about his experiences in the U.S. Entertaining to read in between. Critically acclaimed book, I also think it’s good. What I didn’t like was the fact that you get to know the whole life stories of the main characters although that’s absolutely not necessary to understand the main story. Apart from that this book is OK. 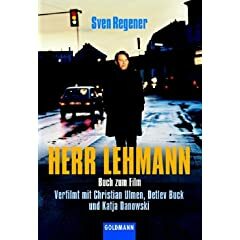 Interesting short stories out of Germany’s history. 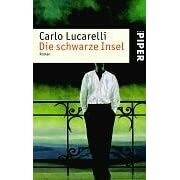 I had already read the book “Der Rote Sonntag” by the same author before, which I liked. But this book here is just nonsense. Don’t read it. This is really a classic. I had already seen the movie a few years ago but only read the book last November. I also want to read the the second part “Neue Var Süd“. You should read this as well if you haven’t yet. 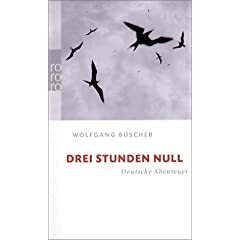 For this book containing several stories about girls Malin Schwerdtfeger has received an award in Klagenfurth in 2000. I had already read her other book Café Saratoga before. This one is good to read in between. 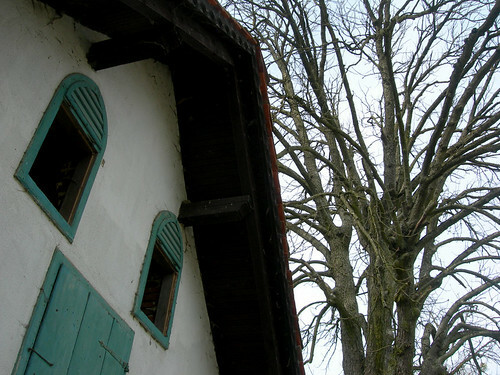 A book containing short stories all set in a Polish village. This book is OK. 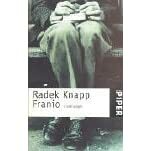 This is the first book Radek Knapp whose debut novel Hernn Kukas Empfehlungen I really liked when I read it a few years ago. 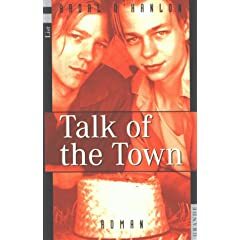 The story about a young guy from an Irish contry town who just has a job as a shop security gard in Dublin, loses his girlfriend and so on. 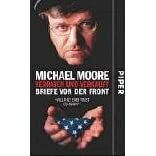 Not the best book I ever read, but OK.
Well I think I don’t have to write anything about Michael Moore here. In this book he just wrote the introduction himself. The rest is filled with letters & emails from soldiers from the Iraq war zone, their relatives and others. 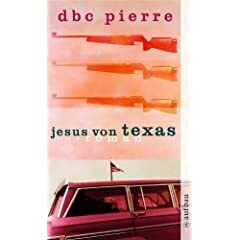 They give a good insight into the madness of this war and American life. All these letters have a right to be printed in this book as a document but still it gets boring after a while. This is the last book I just recently read. I like this book and can recommend it to you. I had also read “Erledigungen Vor Der Feier” by Tilman Rammstedt before. P.S. : There will another post about books soon. I already wanted to write something about the UEFA Champions League for some time now but not because I like watching it or am particularly interested in this tournament. It’s exactly the opposite. For those of you who maybe don’t know, well I’m generally as much interested in the sport of football as I am in tennis or ski jumping, which means hardly at all (Actually I think I’d even prefer watching ski jumping to watching football). The only exceptions are tournaments like World- or European Championships like the EURO 2008, where I even watch one or another match on TV. Anyway let’s cut to the chase. Yes in the past also I was interested in football at least the Austrian league. But also back than I was not interested in the Champions League. Well I think for two main reasons. The first one it that I didn’t have any relation to those teams and for some of them I didn’t even know where their home cities were. Maybe if Austrian teams had been playing there it would have been different. Another – very important – reason why I never liked the Champions League was this classic choir song that has been playing in every single one of these TV teaser on ORF ever since I remember. It may sound ridiculous but that’s how it is. Now that I’m not interested in football any more, I also don’t like the Champions League to say the least. Well it just annoys every time it’s on TV. Well in the beginning I never liked it when ORF started playing CSI nearly every weekday but now I think that those are one of the best parts in ORF’s program (sad, ain’t it?). And now all this in a nutshell: Today I can’t watch CSI:NY because of the stupid Champions League….. Earlier today I looked at the stats for my other (old) bolg ATIE again after a long time. And I found out that, if in Google you search for typical irish leisure the first result is the Nightlife & Leisure category of my very own ATIE blog (only if you are accessing Google from non-English-speaking country). Well actually I think that’s nice also considering that (according to the same statistics) that blog has been visited 4423 times since January 2007 (which was when I installed that statistics plugin). Actually I think that people wont find anything to read about proper leisure activities when they click trough to my blog because in that category I mainly wrote about going out and stuff like this, as far as I remember. But yes, going to the pub for a beer is a typically Irish activity. As I’m talking about the ATIE stats right now, let me mention just a bit more. The most popular search in the results of which ATIE shows up (4th place) is metro bar tallaght. By the way the last search in which my blog showed up just this afternoon was this one. Who ever searches for this??? Last night I finally uploaded the best photos from Friday’s Spring Photo Session 2008. 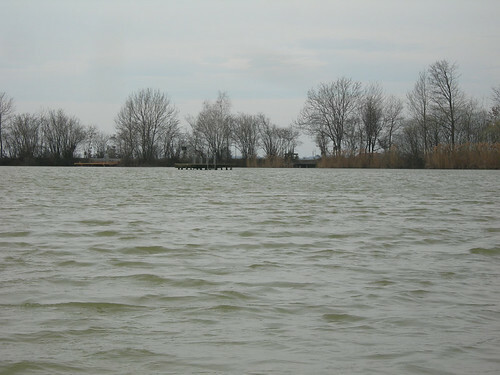 This time we went to the area of Großsteinbach and took photos at the Harter Teich, the “Kneipp Bewegungsturm” in Auffen as well as at Schloss Feistritz. You can see a few of the photos below and the rest of them here on Flickr. By the way: Tonight The Whitest Boy Alive are playing at the Fluc Wanne here in Vienna. I’m really looking forward to see Erlend Øye and the other guys live on stage.